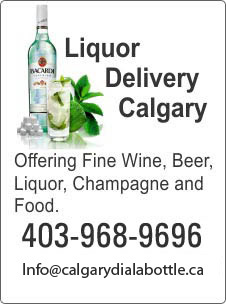 Dial a Bottle Calgary is your ultimate destination for liquor, flowers, gifts, fast food and pizza delivered briskly at home. Through us you get round the clock service for every occasion and preference. You just mention your choice and our experts serve you in a jiffy. Apart from serving usual orders like small get together, a personal moment, family gathering or simply regular requirements, we also take individual as well as bulk orders for special occasions. We are keen to be your perfect partner in Christmas celebrations, Boxing Day festivities, New Year Blasts or any other special events including personal ones like birthdays, corporate events, weddings and bachelor parties. As a Calgary resident, you must be celebrating some festival or the other every month and if not, you are definitely busy in preparing for some upcoming festivity. So, almost always there’s a festive air spread all across. Why not make each special occasion more special by adding something extra…well if you are thinking what that extra might be, leave it to us. At Dial a Bottle Calgary, we enhance your festive mood through our exclusive collection of liquors, choice of flowers packed in well-designed bouquets, attractive gifts wrapped beautifully and more. Already the sound of the jingle bells are becoming more and more prominent, and with each passing day you are getting more and more busy, to see that every nitty-gritty is taken care of for a memorable celebration. If you are hosting a party, obviously you want to give your best to impress your guest. We give you the choicest liquor and attractive add-ons like gifts, flowers, snacks that will definitely click with your guests. Not only Christmas, also enjoy convenience on Boxing Day, the day following Christmas, for which you are certainly planning for the right gift for those you’d love to see happy. Talking about winter festivals like Christmas and Boxing Day, already the mood is set for a New Year blast. And who wants to party without the right beverage? Our unique selection of wine, beer and champagnes is sure to make you party hard on New Year’s Eve. Again, why would you settle with just wine when you can have interesting add-ons like pizzas, gifts, flowers that ensure that the celebration is complete? Whatever the special occasion be, your party reflects your personality. So whether you are celebrating amongst friends or in the midst of superiors or colleagues, it’s the time put your best foot forward. The well-trained staff at Dial a Bottle Calgary is eager to make your celebration a time to remember, be it a widely celebrated event or a personal party thrown on a special occasion.